A vanpool is generally a group of 6 to 13 people with similar travel patterns who ride to work or other places together in a shared vehicle (most often a van). What is the iRide Vanpool program? What areas does the vanpool serve? Currently there are vanpool routes throughout Ravalli, Mineral, Lake and Missoula Counties. These areas include the communities of Hamilton, Victor, Corvallis, Stevensville, Florence, and Lolo (Ravalli and Missoula); Alberton, 9-Mile, Huson, and Frenchtown (Mineral and Missoula); Polson, Ronan, Charlo, St. Ignatius, Ravalli, Arlee, Evaro and the Wye (Lake and Missoula). The program has requests from the Seeley Lake, and Clinton/Turah areas as well. ​What’s the benefit to me to vanpool? Financial: AAA states is costs approximately 56¢ per mile to operate your car. 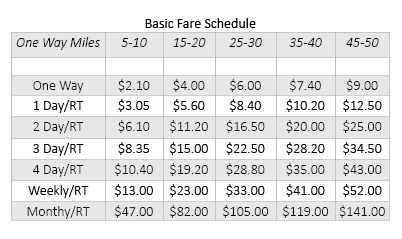 The vanpool per mile fare is between 7¢ to 12¢ per mile rate. Reduced insurance premiums: By driving less many riders have had their personal insurance premiums reduced. ​Health: Lessen the stress of driving to work everyday. Vanpooling gives you the chance to snooze during your commute or catch up on reading. Environmental: Driving together will ease traffic congestion, cut fuel consumption, and reduce air pollution. Professional: By driving together you have the opportunity to network professionally and share business ideas and opportunities. ​What are the vehicles like? Missoula Ravalli Transportation Management utilizes 6-passenger mini vans and 13-passenger vehicles that are designed for commuting. Most vans are equipped with individual reading lights, air vents and reclining captain's chairs. How does the wait list work? People who are interested in vanpooling are encouraged to complete a rideshare application on the website www.mrtma.org. MRTMA reviews the applications seeking at least 6 individuals (minivan) or 8-9 (13-passenger van) either living or working in close proximity of each other in order to form new vanpool routes. For people who work odd shifts, live in sparsely populated areas or distant worksite with few employees the wait time for joining a vanpool can be longer. MRTMA contacts people on the wait list on a regular basis to confirm their status or their situation has not changed and another vanpool route might accommodate their needs. What are the driver’s basic responsibilities? Drivers pick up and deliver the passengers at arranged park-and-ride lots and worksites, oversees required rider logs and notifies MRTMA of maintenance issues. Registered drivers who drive at least 2 full days per week, commute that week for free. Notify the office of the vehicle location on collection days. Can anybody drive the van? The main driver and alternate drivers must be approved by MRTMA and their insurance carrier. All drivers must be at least 25 years old, in reasonable health, with clean driving records. No special licenses are required. Exact costs will vary for each vanpool rider based on the miles traveled and number of days they utilize the vanpool program. Please see basic fare schedule. Collections are performed by the office on a monthly basis. MRTMA does not accept credit cards. Ridership can affect vanpool fares. A cooperative relationship between riders and MRTMA works effectively to stabilize fares. However, a large spike in fuel, insurance or vehicle acquisition cost could impact fares. MRTMA has not increased fares since 2008. How are pickups and drop offs organized? There are a number of different ways to manage the logistics. MRTMA has set up several park-and-ride locations for vanpoolers to meet. On the other end of the trip, drivers attempt to drop off riders as close as possible to their worksite. Drop offs and pickup can vary from morning to afternoon depending on traffic flow, construction or other environmental conditions. How do new vanpools form? MRTMA collects rideshare applications. When there are at least 8-9 people needing to ride at least 4 days per week. Those potential vanpoolers will be contacted. A driver will need to be found among the applicants. Or an individual can recruit co-workers or neighbors about forming a vanpool. Some individuals have approached their employers to sponsor a van. In this scenario fares can be reduced or eliminated depending on the companies financial commitment. If you already have a group of six (would utilize a minivan) or eight or more participants (would utilize a 13-passenger van), call 327-8515 to get your vanpool started.